As the business dynamics continue to evolve in today’s digital word, it is imperative to identify a system that can support businesses in their growth journey – from a start-up to a global enterprise. According to a survey conducted by International Joint Conference on Science and Technology, start-up companies are becoming increasingly interested in adopting cloud based technologies that can lead to achieving better cost synergies, scalability and greater agility. Regardless of the stage of growth that a start-up may be in, it is essential to leverage a fully integrated business system that enables the company to connect seamlessly with customers, partners and suppliers - from any device, at any place, and any time. Little wonder NetSuite has emerged as the #1 cloud ERP system in the market. Currently, over 1500 software companies, from start-ups to enterprises, use NetSuite - making it the leading cloud ERP. Business agility is one of the primary advantages delivered by NetSuite that helps small business innovate and adapt faster. NetSuite allows growing companies to seamlessly manage their mission-critical business processes within one unified system, giving them the ability to focus on innovation, grow, adapt to market changes and to launch into new markets rapidly. For any start-up, coming up with the initial seed capital and meeting business expenses is a mammoth challenge. A successful NetSuite implementation can lead to a reduction in costs associated with on premise IT infrastructure, by offering cloud-based services that are flexible, scalable, and available round the clock. NetSuite is a highly customizable Software-as-a-Service (SaaS) solution, enabling companies to tweak the system to meet their various business process requirements, such as business process flows, value-driven dashboards and metrics. It offers several options for built-in business process flows and dashboards for each industry that allows even small companies to easily, quickly and accurately tailor their enterprise systems to their exact requirements. NetSuite can seamlessly connect all the required information that a business needs into a single unified source by integrating solutions across areas such as ERP, CRM, and e-Commerce among others. These solutions are highly scalable and can accommodate every growth phase of the company, thereby setting you up for a long-term business success. With over 20 years of experience in cloud ERP implementation and more than 40,000 customers, NetSuite is proven and trusted as the #1 cloud ERP solution for a multitude of industries. Its smart cloud financials and accounting software keeps account information updated, leading to faster and accurate reporting and closure of accounting results. Focusing heavily on the next-gen technologies, NetSuite delivers on-going product improvements to empower its customers. Significant NetSuite adoption by startups and SMB’s in the E-commerce and/or retail space is expected over the coming years. 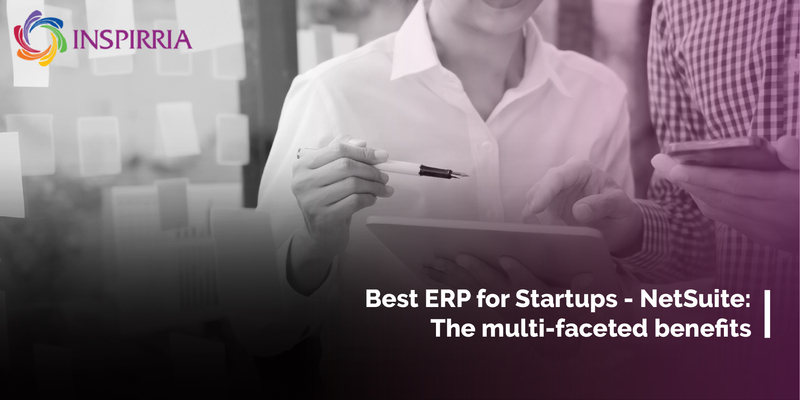 Backed by a progressive leadership and equipped with NetSuite technology, startups and small businesses alike can position themselves for superior decisions to rapidly scale their business. Inspirria have been helping many startups with its NetSuite implementation to deliver fast data driven decisions that is required to be agile and innovative at the speed of business today. Our successful implementation leads to cost efficient, timely and more profitable solution for growing companies to expand their business and move towards becoming global. Inspirria is a leading NetSuite partner offering end-to-end implementation services and support to cater to the dynamic growth requirements of organizations. With more than 14 years of experience in cloud technologies and over 500 clients around the world, we have helped businesses maximize efficiency and visibility for rapid and agile growth.